The Hymans made their first gift to Harvard Law School over a half-century ago, and the first of several planned gifts more than a decade ago. The details of that first planned gift are no longer in the front of Jerry's mind. "It was an annuity," he says, brow furrowed, "which generated a small annual payment." But he has no doubt about the primary intent of the gift: "To benefit the Law School, of course." 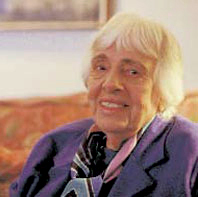 Waltrud Lampé, widow of Ernst Lampé ’41, met her future husband in 1950. Waltrud had survived the terrors of World War II; Ernst was a lawyer on the staff of U.S. High Commissioner for Germany John J. McCloy, on a two-year assignment to help reorganize several German companies as part of the overall Marshall Plan. David and Carolyn Clark — both members of the Class of ’68 — can't remember exactly when they made their first planned gift to Harvard Law School. "Probably in the first will that I wrote," Carolyn muses, "there was a bequest to the Law School." Continue Reading about What Will Make the World a Better Place? Neil Prior began thinking about his ultimate gift to Harvard Law School in the late 1990's. He was motivated by the leadership at Harvard Law School — former Deans Elena Kagan and Robert Clark.